The RHS TATTON FLOWER SHOW (20 - 24th July) has been a fixture in my diary for many years and it continues to provide a great day out in a beautiful setting near Knutsford in Cheshire. I will be exhibiting in the GARDEN ARTS PAVILLION on stand GA/239. The Pavillion has a new location this year so be sure to come and find me. 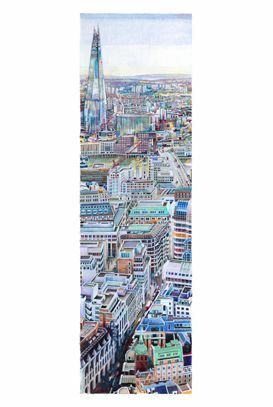 Each year I introduce a new major piece and this year I will be featuring the SHARD in London and you can keep up to date with progress by visiting my facebook page. Ive created a Facebook page which is an up to the minute way of staying in touch with what I'm up to. Have a visit and please let me know what you think...and don't forget to'like' my page so that I can keep you posted on news. I offer my work in a choice of print only, mounted in a museum mount or in a beautiful black frame which I offer as standard across the collection. In one or two cases the picture may call for something different in which case I will offer all the information you need to make your choice. Whether its a framed picture, a mount or just a print, make your purchase something very personal. Visit my Galleries pages and choose from my unique collection. Find out more about what I can offer by visiting my Customer Pledge page. Being an architect gives me a unique perspective on my subjects, mostly featuring outstanding buildings chosen from my travels across Britain and the World. I have developed a detailed and individual style which collectors find not only evocative but full of hidden delights that come to light over time.